A Predator in GTA III. The Predator (or Police Predator from Grand Theft Auto IV onwards) is a recurring police assault boat introduced in Grand Theft Auto III. The Predator is apparently a speedboat designed to serve local police departments, but its performance is typically slightly inferior to even the most basic of speedboats such as the Speeder. However, the Predator is a unique in that it has built-in .50 caliber machine guns on both sides of the hull, thus giving the player the ability to destroy any other boat directly in front of them; however, the guns are also revealed to seize briefly after prolonged firing, implying it is reloading ammunition. 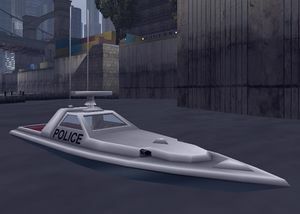 Being a police boat, the Predator will, with the exception of GTA III and GTA Liberty City Stories, appear if the player has a wanted level and is on water; however, despite being a police vehicle, the Predator does not have Vigilante missions associated with it. In Grand Theft Auto: San Andreas, an officer will be on the roof of the boat and will shoot the player if they have, at least, a 2-star wanted level. The Predator has been seen driving around San Fierro Bay if the player has no wanted level or the lock stars cheat activated. In GTA San Andreas, the Predator also has the ability to use the radio, despite being a police vehicle. It also has emergency lights, but no sirens. From GTA IV onwards, the Police Predator does not have the built-in machine guns, having been replaced by two officers on the back who will shoot the player with M4 Carbine assault rifles; the Predators themselves only begin to appear from a 3-star wanted level onwards. As usual, the boat will pursue the player more aggressively with high wanted levels. An early design of the Predator in GTA Vice City. GTA IV, with police officers at the back aiming for the player. The Predator serves as the basis of another boat in GTA III, known as the Ghost (Missing). Appearing only in the mission Gone Fishing, the Ghost sports an entirely blue (PS2 version) or black (Xbox, PC, and mobile versions) body and lacks the twin machine guns of the Predator. At the docks next to Asuka Kasen's apartment, Newport. By the northern runway of Francis International Airport. Below the Links Bridge, next to Leaf Links. Sometimes you can find Predators in the waters. Or if you earn a 2 star wanted level or higher, you can swim to the Predator, kill the police officers on the boat, and retrieve the boat for yourself. By the southern runway of Francis International Airport. The only way to obtain one is by getting a wanted level near the water. When the boat is near, kill the officers onboard and clear your wanted level. A Vigilante mission for the Predator may have been planned in GTA Vice City. The description for the Predator in the BradyGames Official Strategy Guide is "Hop inside the Predator and take out some bad guys for some Vigilante action on the high seas." In GTA Vice City Stories, the brakes for the boat do not work, although it can still go in reverse. In GTA IV, there is a bug that causes water to appear through the floor of the boat. Trying to move around in the boat or jump out while the boat itself is still in motion will cause the player to fall over and lose health or Body Armor. One cannot jump out until the boat has stopped. This page was last modified on 17 May 2015, at 17:32.